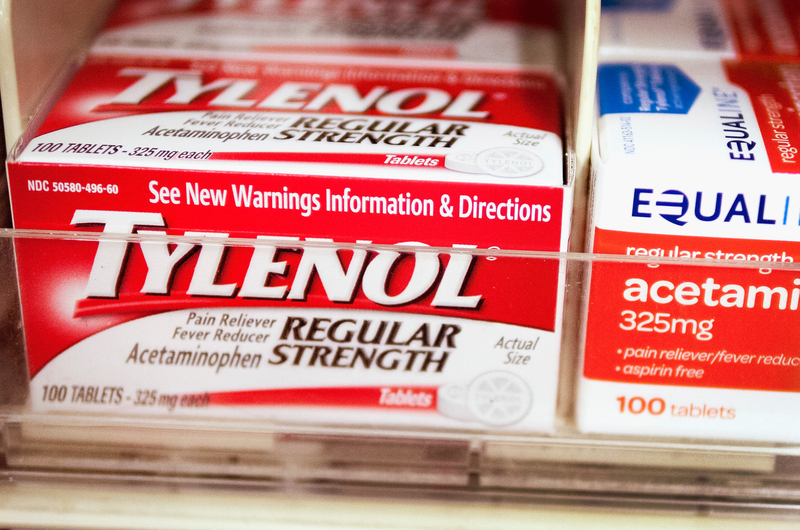 Before you pop some Tylenol for that headache, you might want to consider a new warning. The Food and Drug Administration says high doses of acetaminophen, found in many over-the-counter cold medicines and pain killers, can lead to liver damage. In a safety statement released Tuesday, FDA regulators recommend that health professionals stop prescribing combination drug products with more than 325 milligrams of acetaminophen. Limiting the amount per dosage can prevent an inadvertent overdose — which may lead to liver failure or death. Overdoses from prescription combination drugs containing acetaminophen, such as Percocet and Vicodin, account for nearly half of related liver failure in the United States. So if you decide to take a little extra Tylenol with your prescribed painkillers to ease the aches, you may be doing more harm than good. "Many consumers are often unaware that many products (both prescription and OTC) contain acetaminophen, making it easy to accidentally take too much," the FDA says. More than 35 years have passed since the FDA appointed a panel to review the safety of over-the-counter pain killers and finalize regulations on drugs including acetaminophen. A report by Pro Publica and This American Life found that more than 1,500 Americans died in the last ten years after overdosing on the drug. But FDA officials acknowledged the agency had moved sluggishly to address the mounting toll of liver damage caused by acetaminophen. They blamed changing research, small budgets, an overworked staff and a cumbersome process for changing rules for older drugs such as Tylenol slowing them down. There have been several attempts in the last few years to curb the issue. In 2011, the FDA asked drug manufacturers to limit the amount of acetaminophen in their products to no more than 325 milligrams per pill. McNeil, the makers of Tylenol, say their hearts go out to those who have overdosed and to the families of those who have gotten sick. The company's Vice President for Medical Affairs, Ed Kuffner, also says they've worked closely with the FDA and "funded more studies on acetaminophen than any other single public or private organization." We're quick to turn to painkillers for a quick fix, but many don't know the pitfalls of those tiny pills or teaspoons of medicine, which can have tragic consequences. Acetaminophen has also been associated with a risk of rare but serious skin reactions, which can be fatal. So maybe you want to consider alternative pain treatments like acupuncture, stress-therapy, or even medical marijuana. Hey, if New York is trying it, it can't be all that bad, right?